Like Rocket Fuel for the Mind! What is speed reading? How do you speed read? Now that we’ve entered the Information Age, more and more people are asking these questions every day. Whether you’d like to get through the morning newspaper in less time, manage that thick stack of reports and proposals on your desk, or just curl up with a juicy novel, Speed Reading is one of the most valuable skills you can possess. Ironically few programs for reading speed and comprehension can boast that they’re both highly effective and entertaining. 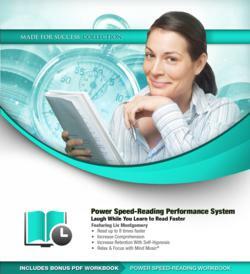 Unlike most other programs, Power Speed Reading delivers you potent techniques to improve your comprehension and speed of reading while delivering powerful hypnosis methods for overcoming any resistance you may have to flying through your reading material. If you’ve tried other speed reading programs before and failed, fasten your seat belt for a fun and fabulous ride like nothing you’ve ever experienced before. Power Speed Reading really packs a punch, allowing you to break through all barriers and increase both the comprehension and speed of your reading, leaving only one question: How soon can you get started? FEATURING LIV MONTGOMERY! Laugh while you learn! Liv Montgomery takes a fun, entertaining approach to coaching and consulting for today’s busy entrepreneur. Liv has spent more than a decade developing the proprietary training methods she uses to produce quantum results for her clients. As a small business consultant, Liv knows how important it is to grasp information quickly, to be understood and to command respect. Liv’s background in big-time media production combined with her experience as a certified Life Coach and Hypnotherapist create a unique chemistry that’s like rocket fuel for the mind.